Retinal diseases such as age-related macular degeneration and diabetic retinopathy are 2 leading causes of blindness. Today, new and improved treatments have significantly improved the success rates and visual outcome of these diseases. A gradual progressive loss of central vision. The onset is insidious and patients may not notice it till it reaches a more advanced stage, when the central vision becomes blurry or distorted. This is the more common form of AMD which accounts for 90% of cases. Deposits known as drusen may accumulate beneath the retinal layer. There may also be progressive thinning of the macula and deterioration of the nerve function. A sudden dramatic loss of vision. There may also be distortion of vision or a shadow over the central vision. The visual loss may be profound. This makes up 10% of cases of AMD and may cause devastating visual loss. In some instances, good vision may be lost within a few days. This results from the development of abnormal leaky vessels or a membrane beneath the retinal layer. which may cause the results to bleed or leak fluid, proteins or fats. This can give rise to a separation of the retinal layers and loss of vision. In the late stage, this may lead to scarring over the macula. A thorough eye examination by an eye specialist will be able to confirm the presence of AMD. An optical coherence tomography (OCT) and fundus fluorescein angiogram (FFA) may be performed to look at the extent and severity of the disease. A new and improved treatment using anti-VEGF medication has a higher chance of preserving and improving vision in patients with wet AMD. This medication is aimed at stopping abnormal blood vessel growth by inhibiting proteins called vascular endothelial growth factor (VEGF). VEGF is thought to contribute to development of macular degeneration by promoting the growth of abnormal blood vessels in the retina. The results were found to be superior to laser treatment and is now the primary treatment for wet AMD. Drugs such as Lucentis (ranibizumab) and Eylea (aflibercept), are administered through injections into the eye. In some patients, anti-VEGF treatment may be combined with laser treatment to seal off the abnormal vessels and prevent leakage of fluid from these vessels. Argon laser or photodynamic therapy with Visudyne treatment may be used, depending on the nature and location of the abnormal vessels and membrane. These treatments may help to slow down the progression of the disease and prevent further visual loss. While there is no proven treatment for dry AMD, certain lifestyle modifications such as quitting smoking may help reduce progression of the disease. This includes controlling hypertension, lipid levels and other cardiovascular diseases. A healthy diet of green leafy vegetables, fruits and fish may lower the risk of AMD. Nutritional supplements containing lutein, zinc, vitamins A, C and E may also help to reduce the risk of developing AMD. The use of low vision aids may also help in the visual rehabilitation of patients. Diabetes mellitus can affect the eye in many ways. A common complication is diabetic retinopathy where the small vessels of the retina (nerve layer) are affected. This is a major cause of blindness in developed countries, including Singapore. The incidence of diabetic retinopathy increases with the duration of diabetes, and patients with more than 10 years of diabetes have a high chance of developing some degree of blood vessel abnormality and retinopathy. People with insulin-dependent diabetes and who have suboptimal diabetic control are more likely to develop complications. Patients with diabetes should go for regular eye checks to monitor for eye complications of the disease. A thorough check which involves examination of the retina will be carried out. An FFA can be done to evaluate the extent and severity of any areas of leakage, abnormal vessels or areas with insufficient supply of oxygen. In the early stage of diabetic retinopathy where there are mild retinal changes, the patient can be monitored regularly. In the later stages of the disease, laser photocoagulation may be performed to slow down the progression and prevent loss of vision. The laser treatment is performed as an outpatient procedure over several sessions. A laser beam is focused on the retina which induces areas of scarring. This helps to reduce the stimulus for further new vessel formation and close abnormal leaking blood vessels, which prevent new vessels from developing. In severe cases where there is bleeding in the eye, a vitrectomy may be required to remove the blood and gel in the eye as well as to remove any scarred tissue. With smaller instruments used during the surgery, the wounds are smaller and do not require stitches, reducing postoperative discomfort and recovery time. For patients with diabetic maculopathy where the leakage of fluid and retinal swelling are very central, the use of anti-VEGF medication has been shown to improve the visual outcome of patients. This medication can be injected into the eye to prevent blood vessels from leaking fluid and causing macular edema. In the early stages of these diseases, there may be little symptoms. It is therefore advisable for patients above 45-50 years of age to do an eye examination at least once a year to detect these age-related diseases earlier so that they can be treated as soon as possible. Patients with diabetes should ensure good control of their diabetes and blood sugar levels, with proper diet control and medication to prevent the onset and progression of diabetic complications in the eye. Successful treatment of these diseases depends on early detection and treatment. In the early stage of diabetic retinopathy, there are tiny blood spots, small microvascular changes (microaneurysms) and leakage of proteins and fat (exudates). This may occur in any part of the retina and the patient may not notice any visual symptoms. As retinopathy progresses, new abnormal vessels may develop (neovascularisation) on the surface of the retina or the optic nerve, which may rupture and bleed into the eye and cause a sudden loss of vision. There may also be scarring and fibrosis around the vessels and optic nerve which may cause traction and pull on the retina, resulting in retinal detachment and loss of vision. The fluid leakage into the area of the retina which is responsible for clear central vision (macula) is called Diabetic Macular Edema (DME). Today, about 11% of diabetes patients have DME, and 1 to 3% actually suffer from loss of vision because of DME. 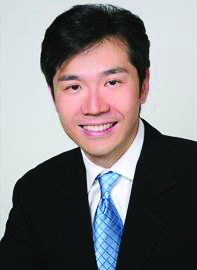 Dr Leonard Ang is the Medical Director and Senior Consultant Ophthalmologist at Lang Eye Centre located at Mount Elizabeth Novena Hospital. He has won more than 30 international and local scientific awards, including the Singapore National Academy of Science Young Scientist Award and the Singapore Clinician Investigator Award, and has written more than 90 scientific publications and book chapters.